Someone better tell Fox News and Jon Stewart that I really exist. I am the actual guy waging war on Christmas. If you have been anywhere near the internet these past few days, you know that the annual “War on Christmas” meme is in full force, particularly on Fox News. Jon Stewart took advantage on Dec 3rd, to poke some hilarious fun at the idea that Christmas is under attack. That being said, I think this year I am actually signing up. I think I want to openly go to war with Christmas. Against Christmas. As Christmas’s enemy. Every year as soon as Halloween is over, I see myself falling into the same patterns of avoiding Christmas. For nearly two months every year, I work hard not to have Christmas. So why not be open about it? Why not embrace the War on Christmas? Throughout most of November and December, I do many things to keep Christmas from being celebrated. I try very hard to avoid saying “Merry Christmas”, and I prefer to be greeted with Happy Holidays. I even actually like the shorthand X-Mas. I make note of all the other holidays being celebrated in my calendar. Hanukkah, the Feast of St. Nicolas, Santa Lucia, Kwanzaa etc… I have even been able to cancel a few community/workplace Christmas pageants in the past few years and it felt great! I don’t think Christmas should be in schools, I don’t think it should be in the workplace, I don’t think it should be noted by public figures or politicians. 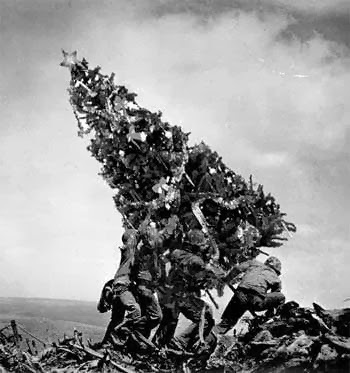 If I could remove Christmas from most of the last 8 weeks of the year, I will have succeeded in my war. Christmas music can be the worst! I generally don’t listen to Christmas music in my car or at home, and it irks me to have to listen to it when I can’t control the sound system. I complain when hear Christmas music in malls. The sound tracks playing in most commercial spaces make me want to thrown up. Christmas concerts annoy me, especially the ones on TV. I get sick of Christmas music so quickly. It feels like the drummer boy is using my head as a drum. And when pop musicians make Christmas albums, I almost wish I was deaf. When I see decorations in public spaces, a part of me wants to tear them all down. All the green boughs, the red bows, the holly, the wreaths, the ornaments, all of it could just disappear and I would be fine with it. I just don’t get why people want Christmas lights all over the place, even if it does get darker sooner in November. I often criticize stores that sell Christmas merchandise and I try not buy any. Christmas inventory is so kitschy most of the time. I scoff at people who put light displays up on their house after Halloween. And don’t get me started on those who put up Christmas trees in November… it drives me nuts. What is the point of having a giant tree up for month in anticipation of present opening day? In my work life, I spend a lot of time encouraging the people around me to keep from celebrating Christmas too. I try to keep Christmas from invading my workplace and I always schedule work for myself on Christmas Eve and Christmas Day, and then after those big days, I have time with my family and friends. I am becoming more sure that the people I work with think I am the grinch who has stolen their Christmas joy, because I force them to put a lid on the Christmas celebrating. Now with Facebook and Twitter becoming ‘War on Christmas’ battle grounds, I have become a Christmas grinch on social media. I have called out my friends for loving Christmas too much. I have advocated pairing down the celebration and toning down the cheer a notch. In November and December most years, I just wish Christmas would go away. So when Fox News folks start complaining about the War on Christmas, I feel like saying, “Yeah, finally we are winning.” Christmas is getting what it deserves. It is getting pushed aside, moved out of the way. I want something else to take its place, I want a new holiday for November and December. Or rather, I want an old holiday. For you see, I am a Lutheran Pastor. Sarah Palin, one of the Popes of American Right-Wing Christianity recently said, “I love the commercialization of Christmas, it spreads the Christmas cheer.” She has missed the point. Obviously. But she has named an important reality. We just don’t want to deal with the things that Advent deals with. We want to avoid the harsh realities of life, and have a big party instead. A party that has now become the symbol of global inequality and broken social systems. Christmas has no meaning on its own. Christmas is empty and vapid when it is a two month opportunity to increase debt and avoid real issues. Christmas only makes sense at the end of Advent. It only makes sense when we have waited and watched for Messiah. It only makes sense when we have longed with Israel to be released from captivity, exodus, exile, and oppression. It only makes sense when we have admitted our failings and imperfections, when we have admitted the suffering of the poor and lowly around us, the injustice of the marginalized and victimized, when we have admitted that we are complicit in perpetuating systems of violence, abuse, and death. There is a reason, I wage war on Christmas each year. Because it isn’t Christmas yet. We haven’t got there, we have missed what needs to come before. As we long for Messiah through Advent, and discover again all the ways in which our world needs a Saviour, the Feast of the Nativity, the Feast of the Incarnation can finally take real shape. The coming of Messiah into our dark and broken world can finally be the light and hope we truly need. Our world is still very much in need of a Saviour, our world is full of captivity, exile, exodus, oppression, conflict, suffering, poverty, systems of violence, abuse… and death. We don’t like Advent because it means we aren’t there yet, and that feeling opens up a whole world of emotions, ideas and experiences that we don’t want. We want to be at the party, not sitting outside hoping to get in. But that is where most of the world is, sitting outside waiting to get in… and realizing they almost certainly never will. So tone the Christmas down this year. Put out 4 candles, and wait with all those who still need a Saviour more than Christmas present. And maybe after waiting with me, with Israel, with all those who still need saving, you will see why we don’t sing “Joy to the world” until we have sung “O Come, O Come Emmanuel” first.